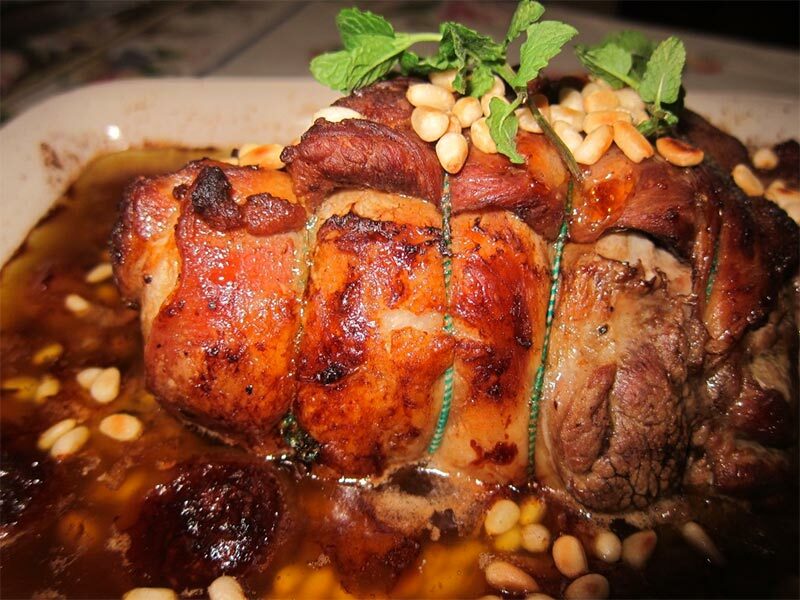 Stuffed with our apricot, almond and lemon stuffing this is a fine, full-flavoured, family feast. Serve with dauphinois potatoes (see recipe) & lemon and honey glazed carrots to carry on the fragrant theme of the stuffing. 2Brush the joint with olive oil, season lightly and sit in a snug roasting pan. Roast for 40 minutes at this high temperature then lower the oven to 150°C and pour a generous glass of white wine around the joint and throw in a sprig of rosemary for good measure. Cook for a further 2 - 2½ hours until the meat is tender - by now the juices produced will require a little skimming to remove excess fat but otherwise be a lovely sauce without further messing about. Should serve 8-10 depending on appetite. 3Take it out of the oven.